Roger Federer has begun his campaign for a record tying 7th Wimbledon title and record extending 17th grand slam by moving onto the second round with a straight sets victory over Mikhail Kukushkin, 7-6 (2) 6-4 6-2. 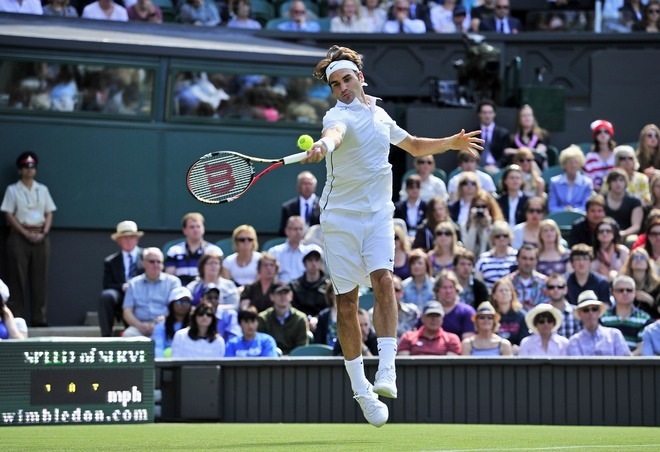 Federer served very well from start to finish with incredible precision. This is something rather new we are seeing lately from Roger – consistent and precise high percentage serving – and it is exciting to see. Updated: This video cannot be embedded but you can watch it on YouTube here. Visit WatchLive tomorrow morning to access live streams to watch all the matches. Check out the Wimbledon 2011 photo album at FedererFan ZeroSeven on Facebook. Follow @FedererFan07 on Twitter for instant updates. If you own an iPhone or iPod touch, download (free) the Official iPhone app for Wimbledon. FedererFan07 is the best Federer site on the web.